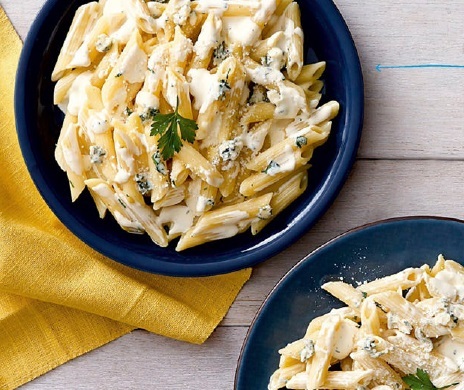 This recipe is a combination of two of my favorite things: cheese and pasta! I love that it's so easy to make. If you aren't a fan of blue cheese, you can use cheddar instead it gives just the right amount of saltiness without the overwhelming cheesy flavor. 1. Cook penne according to package directions in boiling salted water until al dente. Drain and set aside. 2. Mix butter and Gorgonzola cheese in a saucepan over medium-low heat until melted. Add whipping cream; simmer. Add mascarpone, blue, and Parmesan cheeses; stir until dissolved. 3. Toss in cooked pasta. Season with salt and pepper. Garnish with parsley.